September courses begin officially on August 14, the focus weekend takes place September 9-10, and final assignments are due October 13th. While the weekend begins with breakfast at 7:30 for students on ordination and PMA tracks, course instruction does not begin until 1:00 p.m., which gives you the flexibility of driving to Topeka on Saturday morning, rather than on Friday evening. If you are taking a class for personal enrichment or continuing education, you are welcome to spend the night at Upton Hall on Friday night, and join us for breakfast and morning prayer on Saturday morning. While the 8:45 colloquium session is a closed group for students on an ordination track, you are most invited to join us at 10:15 for our praxis session, which addresses some practical area of ministry. Classes wrap up by 12:15 on Sunday. If you would like to audit a course, the tuition is $100. If you would like to take the class for credit, the tuition is $180. The cost includes meals and overnight accommodations at Upton Hall on Friday and Saturday night (on a space-available basis). If you wish to take the class for credit, we encourage you to enroll by August 14. However, if you wish to audit the class, you may register at any time prior to the focus weekend. The purpose of this course is to introduce students to the Bible, both Old and New Testaments. Where did the Bible come from? Sources of development? Authorship… Cultural context… Translations…. How the Episcopal Church views and uses the Bible. How does the Bible fit into our post-Christian, post-Modern age? Welcome to the Bible. Vicki Black and Peter Wenner. Church Publishing. Transforming Scripture. Frank Wade. Church Publishing. The Rt. Rev. Michael P. Milliken is the 5th Bishop of the Diocese of Western Kansas. As a Priest for 44 years, Bishop Milliken has served parishes in Kentucky and Kansas. He holds degrees from the University of Kentucky; The Episcopal Theological Seminary in Kentucky; and Xavier University in Cincinnati. Over the years, in addition to parish work and serving the wider church in many ways, Bishop Milliken has taught Contemporary Theology at Xavier University as well as courses in Old & New Testament; Morals and Ethics; and Comparative Religion at the Hutchinson Community College. This course is a close examination of the Prophets and Writings of the Hebrew Bible (which, for our purposes, will include Isaiah through Malachi, Psalms, Proverbs, Job, Song of Songs, Ruth, Lamentations, Ecclesiastes, Esther, Daniel, Ezra, and Nehemiah). 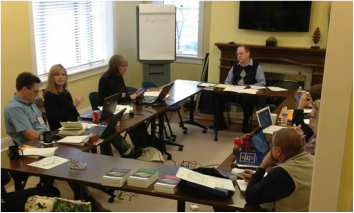 The course will focus on the historical settings, literary artistry, and major themes of these books and is meant to equip participants with the tools necessary to read biblical texts critically and to appreciate their complexity. To these ends we will read the biblical text primarily from the perspectives of its ancient authors and readers. Brueggemann, Walter. The Prophetic Imagination, 2nd edition. Minneapolis: Fortress, 2001. Clifford, Richard J. The Wisdom Literature (Interpreting Biblical Texts Series). Nashville: Abingdon. 1998. This course focuses on the history of Christian Theological ethics in the west over the last 150 years. Beginning with the emergence of the social sciences and the growing ascendancy of the natural sciences, the class will proceed by examining the rise of liberal theological ethics and its eventual challengers. The course will take special note of the effects on theological ethics of a growing consciousness of the social, historical, and cultural nature of human existence, including an increased appreciation for the significance of difference in human experience and identity. A number of movements and perspectives will be encountered. Specifically, the course will cover the Social Gospel movement of the early 20th century (including Christian Socialism), Divine Command ethics, Christian Realism, the ethics of Responsibility, modern Casuistry, Narrative (or Postliberal) ethics, theocentric ethics, and ethics rooted in the various voices of Liberation Theology (Feminist, Black, Womanist, Latino/a, Mujerista, etc.). Wayne G. Boulton, et. al. (editors). From Christ to the World: Introductory Readings in Christian Ethics. Grand Rapids: Eerdmans, 1994. The Rev. Dr. David Cox has been the Associate Rector at St. Michael and All Angels Episcopal Church in Mission, Kansas, since June of 2013. He was ordained to the priesthood on December 1, 2012, in the Diocese of West Missouri. Prior to his current position, Cox taught sociology, religion, and ethics at the junior college level for five years. He earned his Ph.D. in Religion and Ethics from Vanderbilt University in 2007. Cox’s research and teaching interests include both theological and social ethics, with a special interest in the work of H. Richard Niebuhr and ethicists influenced by him.